Jerusalem (AFP) - The United States moves its embassy in Israel to Jerusalem next week in defiance of the Palestinians and most of the world, likely further heightening tensions at a time of tumult in the region. US President Donald Trump is set to make good on his pledge in December when he broke with decades of precedent and recognised the disputed city as Israel's capital to global outcry. The embassy inauguration due to take place Monday caps his decision but comes at a particularly fevered time, after weeks of deadly protests and clashes along the Gaza Strip's border with Israel. It also follows Trump's announcement on Tuesday that the United States will withdraw from the Iran nuclear deal, creating a new level of uncertainty in the turbulent Middle East, and Israeli strikes on dozens of Iranian targets in Syria. Thursday's deadly air strikes followed rocket fire toward Israeli forces in the occupied Golan Heights that Israel blamed on Iran. Monday's ceremony will include some 800 guests and a White House delegation -- though not Trump himself -- at what until now had been a US consulate building in Jerusalem. Less than 100 kilometres (60 miles) away, more protests are planned along the Gaza border, with some Palestinians vowing to rush the fence and try to break through despite Israeli snipers deployed on the other side. Israeli Prime Minister Benjamin Netanyahu has sought to portray the "historic" US embassy move as encouraging other countries to do the same, though that has not played out on a significant level. "I must tell you that the bold decision by President Trump has prompted other countries, quite a few now, who are planning to move their embassy to Jerusalem as well," Netanyahu told US Secretary of State Mike Pompeo when he visited Tel Aviv last month. Senior Palestinian official Nabil Shaath told journalists Wednesday that Trump is supporting "Israeli cleansing of our people from Jerusalem, and is giving Israel a chance to violate all the international law that guarded this situation". Beyond the disputed nature of the city, the embassy move will take on added signficance due to the date when it will occur. The following day is when the Palestinians mark the "Nakba," or catastrophe, commemorating the more than 700,000 Palestinians who fled or were expelled from their homes in the 1948 war surrounding Israel's creation. On the Gaza border, 52 Palestinians have been killed by Israeli forces in protests and clashes since March 30. No Israelis have been wounded and the military has faced criticism over the use of live fire. Some young protesters gathered near the fence last Friday pledged a rush towards the fence on May 14, though much will likely depend on whether Hamas encourages such actions. "We will cut the siege, then enter inside," a 22-year-old who only gave his name as Hani said, adding he was not afraid to die. "Our lives are cheaper than Palestine." The embassy move is controversial due to Jerusalem's disputed status. It is perhaps the thorniest issue in the Israeli-Palestinian conflict. Israel occupied the West Bank and east Jerusalem in the 1967 Six-Day War. It later annexed east Jerusalem in a move never recognised by the international community. In the decades since, international consensus has been that the city's status must be negotiated between the two sides. But support for Israel is a key domestic political issue in Washington for Republicans, and Trump decided to move the embassy despite warnings it would further jeopardise remaining chances for a two-state solution to the conflict. He has argued that it helps make peace possible by taking Jerusalem "off the table", but many have pointed out that he has not announced any concessions in return from Israel. The Palestinians have been so angered by Trump's decision that they froze ties with the White House. Palestinian president Mahmud Abbas has castigated Trump's administration and called his ambassador to Israel David Friedman, who has been a supporter of West Bank settlements, a "son of a dog". In the days after Trump's announcement, protests against it were held in various cities in the Middle East and Muslim countries. 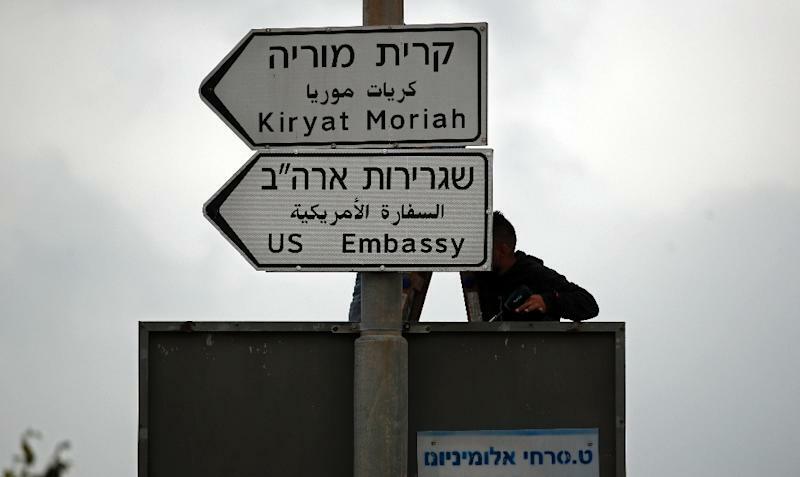 The new embassy is only a temporary arrangement, located at a consular compound partly situated in west Jerusalem and a former no man's land under armistice lines drawn up after the 1948-49 Arab-Israeli war. Eventually, a purpose-designed American embassy will be planned and built, ​​a long-term project according to the State Department.